Remember the delightful black blazer with white trim I found on the American Eagle Outfitters website and coveted like mad? Well, I've found some more trimmed blazers for your viewing pleasure and mine. 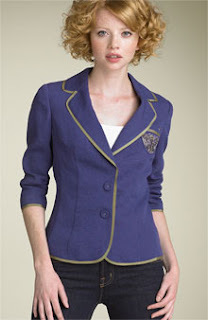 Perhaps the trimmed blazer trend was inspired by the prep school blazer Blair Waldorf sports on Gossip Girl. Hers was customized by GG costume designer Eric Daman, who sewed the ribbon on an ordinary blazer. This would be a great DIY project for the girls out there who aren't as deficient in sewing skills as I am. 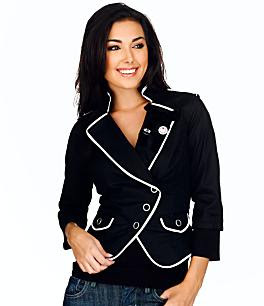 Imagine finding a blazer for next to nothing at a thrift store, taking in the seams so that it fits properly, and sewing on some cute ribbon trim and maybe a crest patch. If this conjures horrible visions of stabbing your finger with a sewing needle and uttering expletives galore, well, there are storebought versions at a variety of price points. I guess the moral of the story is that this is a look you can achieve no matter what your budget. Enjoy! Update: The folks over at Style.com are going crazy for trimmed blazers too. They selected a navy number by Tommy Hilfiger as their Item of the Week. The resemblance to Blair Waldorf's blazer is positively uncanny, don't you think? Methinks TH should start paying Eric Daman royalties. The trim really makes the shape and lines look so nice and sharp. Lovely style. wow.. you found so many of these! I love that last one - and it's cheap! Ooo, I like the asymmetrical version! i like the piping detail. i will just have to buy a blazer since i can't sew at all.